Convenience – everything you need in one pack. Safety – sterility assured, once filled it is locked. Simplicity – just fill and put the cap on. Utility – wide neck, excellent teat, leak-proof cap. Low cost – similar expenditure to nappies. Steri-Bottle® is the world’s first rigid, sterile and disposable complete infant feeding unit that can be manufactured at a cost allowing mass-market adoption. The product represents a fundamental development in the FMCG marketplace that has the potential to become as ubiquitous as the disposable nappy. Steri-Bottle® offers far superior features and consumer benefits to current competitive offerings. Steri-Bottle® has the ability to revolutionize the baby feeding category under one global brand. Sterility, safety – Steri-Bottle® is manufactured so that it is clean, sterile and ready-to-use directly from the package, e.g. bottle, cap, teat, attachment ring are all sterile. This represents a breakthrough for consumer convenience and peace of mind. Single-use obsolescence, tamper proof safety – Steri-Bottle® has been designed to lock after closure in order to assure security of the feed and obsolescence after each use. This function is desired by the consumer for safety/security reasons and ensures high volume usage relative to the number of baby feeds. Convenience – No bottle cleaning or home sterilization is required to make a Steri-Bottle® ready for feeding. The product is individually wrapped, pre-sterilized and ready to go – at home, on the move, anywhere, any time. Filling the bottle with a parent’s choice of liquid is the only step required to feed the baby. The bottle offers a wide mouth design and rigid structure for easy filling. Low price – A breakthrough in design and manufacturing process has been developed to meet mass market pricing standards, thus allowing widespread consumer acceptance for the first time. Recyclables – Meets all EU and US environmental standards for recyclable. 100% recyclable – all elements made of same recyclable plastic family. 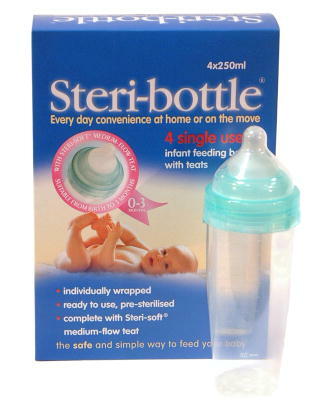 Other Baby Bottles – Steri-Bottle® would enhance the current baby bottle offered by manufacturers of reusable bottles and disposable baby bottle liners.